Mexican migrant laborers provide support to farms in the American southwest. Photo Courtesy of Inside Chico State. 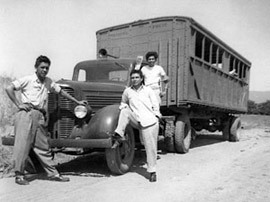 The first large guest worker program began during World War II when thousands of workers came from Mexico to the United States to work mostly as contracted agricultural workers. These workers were called braceros because they worked with their brazos, or arms. Between 1942 and 1964, when the program ended, more than four and a half million braceros came to the United States. While they were supposed to return to Mexico after their contracts expired, many of these Mexican guest workers settled in the southwestern part of the United States. Since the ending of the bracero program, increasing numbers of Mexican farm workers have worked illegally in the U.S. By 1997, over 600,000 farm workers were working in the U.S. without proper visa. Undocumented immigration of Mexican workers into the United States has become a volatile political issue in the west and southwestern United States. Some people argue that these workers take jobs away from Americans, while others say that the Mexican workers are doing jobs that Americans would not take and that they play an important role in the American economy. Estimates place the number of Mexican workers in the U.S. at about 4 million.